The Metallic Rocket line has plasma-cut from a single sheet of high tensile stainless steel (no welds or seams), subtly flared lenses, and a dropped bridge crossbar. This yields a more modern, sleek appearance than the Phenom family of products. 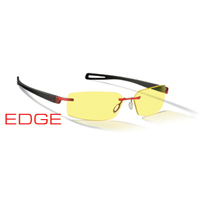 The Catalyst Edge line features rimless lens with sleek profile, integrated modular frame, and sculpted metal hinges. A 'Matrix' like ultra modern look for the power user. 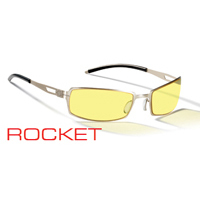 This is the top of the line family of products from Gunnar Optiks. 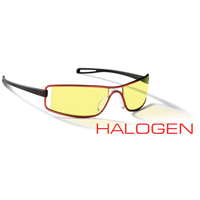 The Sphere Halogen line has hign-tensile micro-tubular frames, internal hinges with non-visible hinge stops, and precision injected polymer temples, and highly wrapped split-lens (the perfect balance of moisture retension and venting). For the ultimate 'surround' experience for users with multiple monitors and gamers. Viewing a never-ending stream of digital information and images can lower visual performance. GUNNAR Optiks' eyewear helps to enhance and adapt the human eye through precision optics specifically mastered for digital data consumption. GUNNAR eyewear is also designed to combine performance, precision, technology and style to help combat Digital Eye Fatigue (DEF) and Computer Vision Syndrome (CVS). 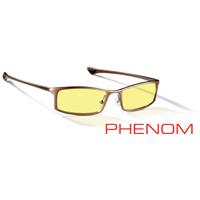 The Attache Phenom line has magnesium/aluminum alloy frames, internal spring hinges, and thermally molded polymer traction points, and is the most affordable family of Gunnar Eyewear.